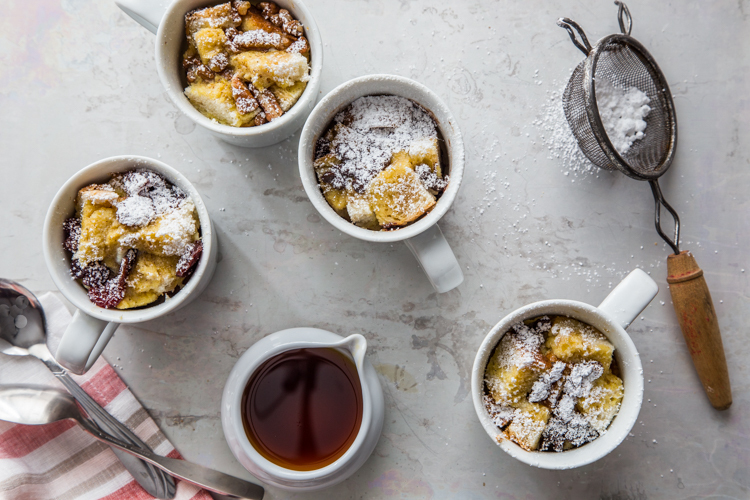 This French Toast in a Mug is definitely a new twist on my typical Tuesday Toast. Usually, I am serving up a bit of goodness on top of a piece of toasted bread. 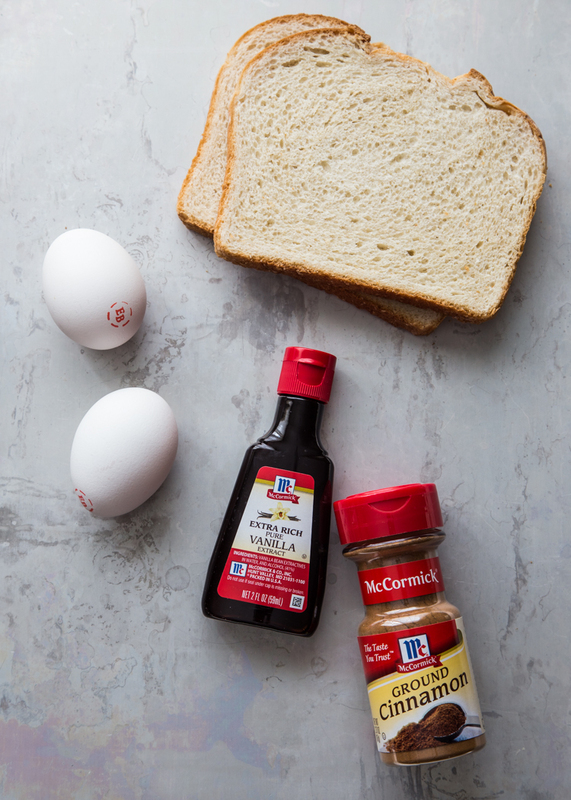 Today, however, the bread is getting mixed with rich milk and eggs and spiced up with McCormick Extra Rich Pure Vanilla Extract and Ground Cinnamon to create an incredibly quick but super comforting breakfast in a mug. I’m so in love with McCormick‘s winter “Hug in a Mug” recipes. McCormick has been sharing all sorts of cookies, brownies and cakes in mugs and I couldn’t agree more that there is nothing more comforting than a sweet tasty treat in a mug. At breakfast, C is always wrapping her little hands around my coffee cup to feel the warmth. It’s just so comforting! I thought it would be fun to take inspiration from some of these drool worthy mug recipes from McCormick like candy bar mug blondies and red velvet mug cakes and make a warm, toasty and sweet breakfast in a mug. I make scrambled eggs in mugs all the time (which I can hardly believe I’ve never posted about…) but I was definitely craving something sweet this time. My first thought was to make a great breakfast bread pudding. You guys know I love bread pudding with my cinnamon swirl bread pudding and this chocolate balsamic bread pudding. But this recipe, particularly with the addition of the McCormick Extra Rich Pure Vanilla Extract (woah, this stuff is amazing!) all I could think of was my mom’s French Toast. My mom always added McCormick Vanilla Extract to her French toast mixture and it gave it a flavor like no other. It’s one of those distinct childhood food memories that comes rushing back whenever I take a bite of her French Toast. It’s definitely something that has stuck with me all these years. So much so, that I realized I needed to call this recipe “French Toast” and not “bread pudding”. To this day, I still am not totally sure what the big difference between the two is, but this is most definitely a French Toast recipe. But also sorta kinda a bread pudding…I’m so indecisive. Now, the vanilla and cinnamon give this little mug of happiness plenty of deep, rich flavor, but I wanted to turn it up a notch and make each mug totally customizable. 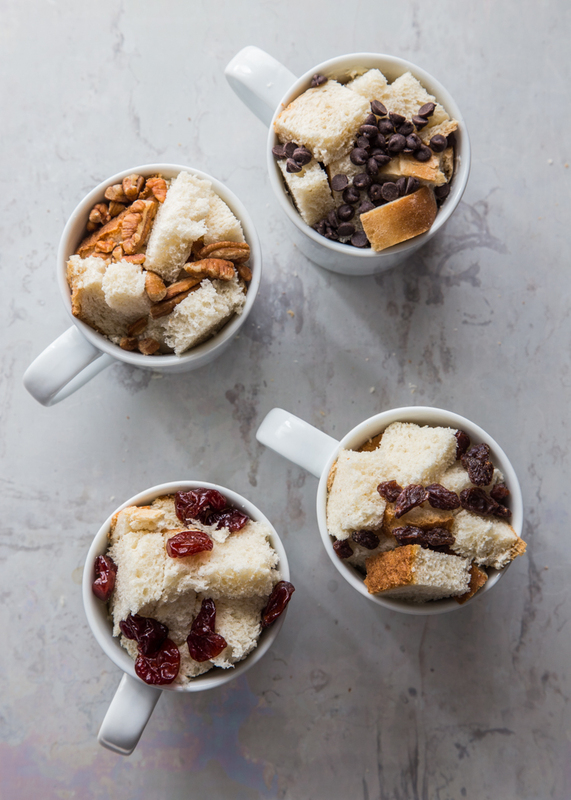 So, when you’re making your family the little mugs of French Toast, let them add their own toppings. Just be sure to layer the toppings within the bread cubes that way you get a bit of the decadent French Toast and a taste of the toppings in every bite. OH – and you cannot forget the powdered sugar and maple syrup. Be sure to check out McCormick.com for more Hug in a Mug recipes and inspiration! 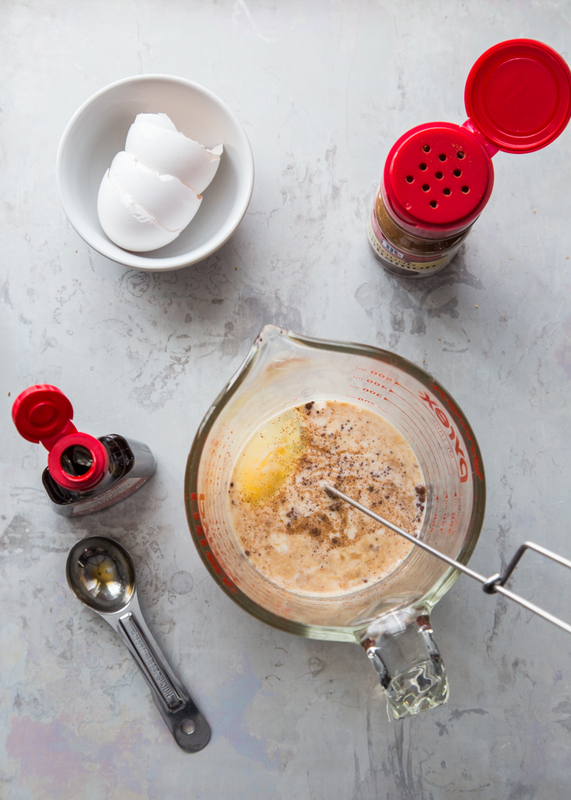 In a large glass measuring cup (or spouted batter bowl) whisk together milk, eggs, McCormick Extra Rich Vanilla Extract and cinnamon. Set aside. Lightly grease the inside of 4 microwave safe 8 ounce mugs with softened butter. Divide half of the bread between the mugs. Top bread with half of the toppings. Repeat the layering with remaining bread and toppings. Gently pour milk mixture over the top of each mug, dividing evenly between the cups. Microwave each mug on high for about 1 minute and 15 seconds or until milk mixture is set. Watch carefully because the French toast will puff in the microwave. Serve warm with powdered sugar and maple syrup. Enjoy! Such a perfect dish for those mornings when you don’t have a lot of time to cook. That said, this is the kind of dish that will have the rest of the family believing you got up at the wee hours to whip up this tasty breakfast. You’re absolutely right, Lynn! Thanks so much for stopping by! This looks so simple and delicious and is so cute!! Brilliant! My husband likes French toast so much more than the rest of us – now I can give him this recipe to make for himself! Thanks, Megan! 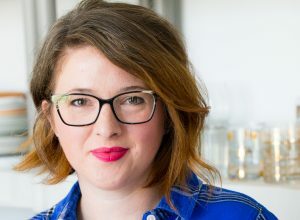 It’s definitely a good recipe for one – you can cut the ingredients in half and make it in a larger mug for a bigger portion size (although it’s not as if it would be giant – two pieces of bread and one egg). The cook time increases a bit, too, but you’d want to test it out in your own microwave. I hope your husband likes it! How totally ingenious. 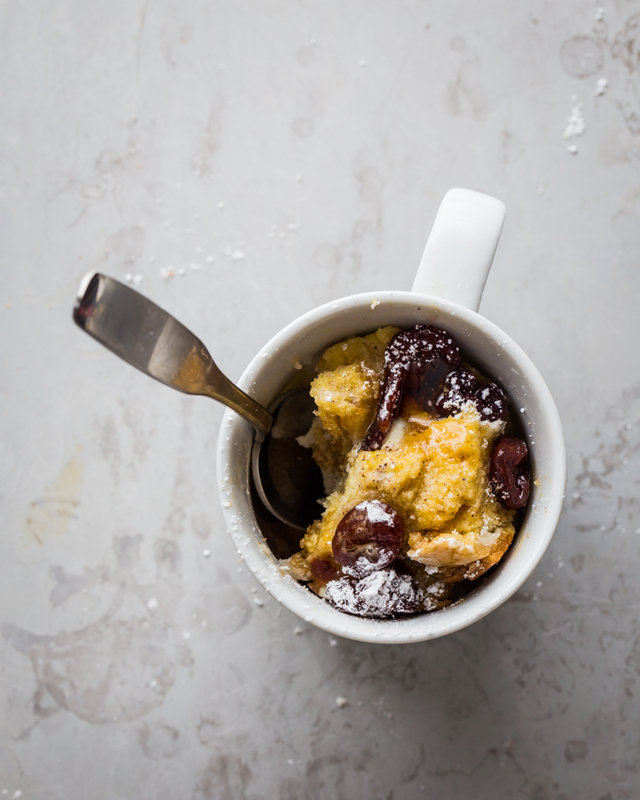 I have a loaf of brioche in the freezer crying out to be a french toast mug cake! Brioche would be amazing in this! Great idea, Erin! this looks perfect!! Simple, practical and yet delicious. Pinned! This looks great for making at work, too!! Make supplies ahead of time, then combine and microwave at work… I’m excited to try it out! OH definitely! Especially if you are someone who doesn’t have a chance to make something before you leave the. It’s so easy and fast! Thanks for stopping by, Meghan! If you are indecisive I am not:definitely bread pudding! I liked this one, but I always seem to get an eggy bottom. How do I stop that? Do I use half the mixture instead? 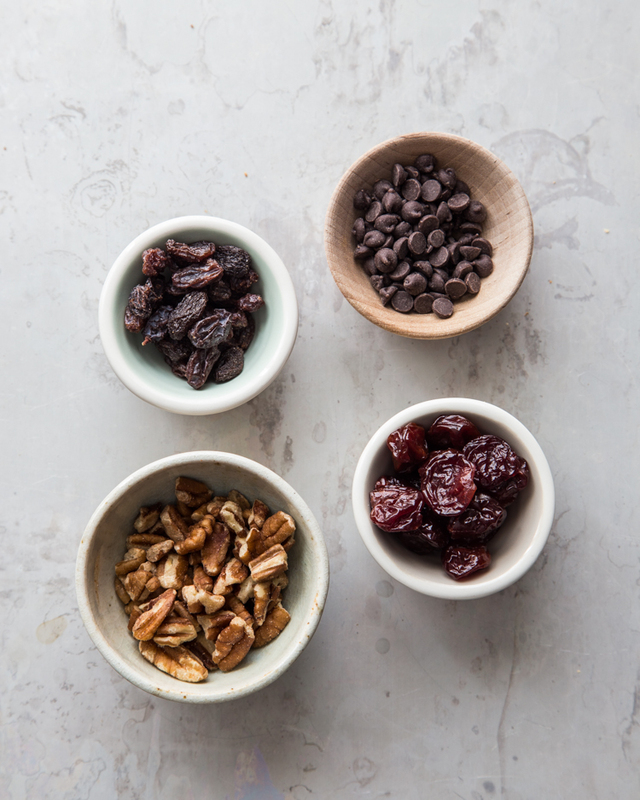 I love the pecan idea!! I’m so happy you liked it! How can I ‘halve’ this recipe. There’s just me. Hi Barb, I would just take half of all the ingredients and bake 2 mugs instead of 4. For the 1/3 cup of milk, use 2 Tablespoons + 2 teaspoons in the egg mixture. Thanks for stopping by! What a great idea! Perfect for a brunch! Love it! It was so chilly this morning and I wanted something simple but hot. I added in chopped pecans and a tablespoon of brown sugar to the mix and it was just what I needed. Thanks so much for sharing. I will be going over to the McCormick site to check it out. McCormick has been a key ingredient in all our heirloom family recipes and I cannot imagine being without there Vanilla! This is so genius!!! I need to try my coconut citrus french toast recipe in a mug- there’s nothing worse than sweating in a hot kitchen during these dog days! Baked it today for brakfast!yummy!! I added some salted caramel with raisins and choco chips into half mugs and some orange jam to the rest.In milk mixture i added a spoon of brown sugar,as well. Served it with sour cream….heavenly! thanx for sharing!!! The difference between French toast and bread pudding is that French toast gets toasted when fried. This is bread pudding. French toast flavored and tasty, but still bread pudding. This looks wonderful! Not an everyday thing but a nice treat one in a while when pressed for time! Unfortunately this ‘fell flat’ for me, literally. It tasted great, but the instant the microwave went off the entire pudding sank and was neither puffy nor golden. This was SO delicious!!! My partner started a new job so I’ve been trying to make some fun and delicious things when I have the spoons to so he has something good to eat before work! This was a hit for sure! Thanks!